A plate of cucumber sandwiches has been the quintessential component of afternoon tea menus since Victorian times. One simply cannot have an afternoon tea from late spring to early autumn without them. Planning the menu for my first outdoor tea party of spring and summer, to be held in the gazebo in the garden, set off a craving for cucumber sandwiches. While I very much enjoy the typical cucumber sandwiches I'm served at most afternoon teas, I've never had one I like quite as much as my own. I do something a little different that makes my sandwiches especially good. A sandwich made with plain sliced cucumber can be quite bland, so I give my cucumber slices a 10-minute bath in a little wine vinegar seasoned with salt and coarsely ground black pepper. The 10 minutes is just long enough to infuse a little flavor into the slices without turning them into pickles or making them go limp. Very thinly sliced tomato is a nice addition when tomatoes are in season. Whatever else you might be tempted to add to my recipe, let it not be garlic. Garlic has no place in a tea sandwich. And mint, though it sounds like a perfectly fine idea, is more often than not overdone. Cream cheese? Love it, but no, not on this sandwich. For afternoon tea, I like to serve three sandwiches or savories, so might add Sliced Egg and Dill Tea Sandwiches and Sausage Pinwheels to the menu, along with Classic Scones, Clotted Cream, Strawberry Jam and assorted treats you'll find under Teatime on my Recipes index page. Of course, the most important thing is knowing How to Make a Proper Cup of Tea! 2 Spread a very thin layer of very soft butter (never margarine) on each slice of bread, and then spread on a very thin layer of mayonnaise. Place 8 cucumber slices (2 rows of 3, then 2 to fill the voids) on each of 8 bottom bread slices. If using tomato, add a thin layer of peeled and very thinly sliced tomato. Top with remaining bread slices. Trim off crusts and cut each sandwich into quarters (fingers or triangles), arranging on a plate in about three layers. 3 Lay a good-quality white paper towel on top of the sandwiches. Wet and wring out well another paper towel; lay the damp paper towel on top of the dry paper towel. Never place the damp paper towel directly on top of the sandwiches or they will become soggy. Wrap rather snugly with plastic wrap; refrigerate for at least an hour or up to several hours. This will make your sandwiches “hold together” and keep them from drying out. When ready to serve, remove from refrigerator. Uncover sandwiches just before serving. *Such as Oroweat/Brownberry/Arnold country buttermilk bread that comes in the wider 1 1/2-pound loaves. If you use smaller bread slices (as I do when I have my homemade Classic White Sandwich Bread on hand), you’ll make more full-sized sandwiches to come up with the same quantity of tea sandwiches. This is the best cucumber sandwich recipe ever! I have served tea after Saturday sailboat races in Maine for a number of years. Many ladies take turns throughout the summer, I like to do the first tea and get it out of the way! Plus, I don't have to get nervous about doing as good a job as the last hostesses. I served these last year and everyone was amazed at how amazing these tasted, very surprising. Even the old-timers were impressed! Mind you, this tea tradition has been going on longer than I have been alive, so you can imagine how many cucumber sandwiches these folks have eaten. I copied the recipe and have it tucked in my special section on never to loose! Thank you Jean for the most impressive and delicious cucumber sandwich! Mary, thank you sooooo much! Afternoon tea is such a big part of my life, I really do try to make every aspect of it especially good. It makes me so happy that you and your guests like them so much! Well, they say castor oil is good for you too! God left off my taste buds for cucumbers and tea. However, I do admire people who can detect and savor such blandness! Am going downstairs to wash my mouth out with Coke (like Warren Buffett). And what a delight it is here. I don't know why I am so intimidated when it comes to giving a tea for friends. Serving your clotted cream will guarantee a hit, and perhaps will calm me down. I absolutely LOVED your rant. I used to rant likewise myself, on a blog. A lot of current writers have a strange sense of the world. Do you have any tips on freelancing, maybe doing blog posts or such? I know this is kind of a loaded request but it's done now. Sully, I've always said you eat like a 6-year-old, so when we saw what Warren Buffett said about his diet ... well ... Now go rinse your mouth out with Coke, but don't swallow any! Anonymous, glad you enjoyed my rant last week! I don't really have any tips on freelancing, other than 'Be persistent.' Oh and 'Write about something you love' (have a real interest in). I too like to soak my cucumber in vinegar. It just adds a little more flavour. I do use cream cheese however mixed with just a little mayo. Your tomato makes them sound really delicious. I will have to try the tomato. It makes them more colourful. 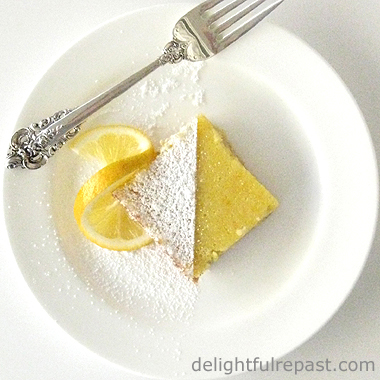 Thanks for sharing your recipe and joining me for Tea Time. Enjoy your day. Thank you, Sandi! Yes, when using cream cheese, a little mayo makes all the difference. Love my mayo, though purists might insist on using nothing but butter alone. 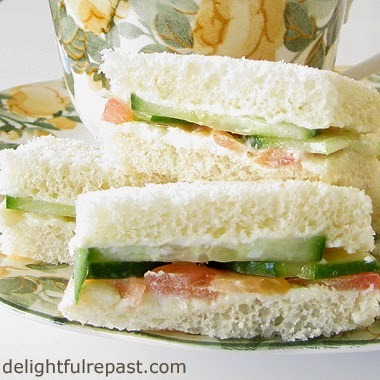 Jean, cucumber sandwiches are one of my favorites, especially on a really warm summer day! Linda, thank you. Yes, aren't they refreshing on a hot summer day! That is such a smart idea about the paper towels! The plate of cucumber sandwiches is beautiful and makes me hungry. Nothing like the fresh, summertime crunch and taste of cucumbers. Thanks for the tips. Thanks, Judy. I think it's probably been about 30 years since I first came up with my paper-towel method; it never fails. Beautiful. These sound lovely, especially the tomato! P. Perfection, thank you! They are my favorite! Thanks, Laura. I appreciate the Pin! I've eaten cucumber sandwiches before but these are a step above anything I've done, I'm sure. Perfect for an afternoon bite. Oh, Maureen! Thanks so much! Aaaw, thank you, Amy! You've seen the show then? I didn't know if anyone would know what I was on about! I drink tea every afternoon (mostly with oat cookies), but don't know why never with sandwiches. Must give this a try soon. They look so light and great. I do like a proper afternoon tea. I shall try these cucumber sandwiches in the summer. At the moment with cold days and a fire roaring in the grate, we're more likely to have high tea with cheese pudding or crumpets. Nicole, I hope they like the sandwiches as much as we do. Let me know! Angie, thank you. The sandwiches are always my favorite part of afternoon tea. Anne, I agree. Not a cold weather sandwich. Wait for a warm day! Thank you for sharing that, Donna. I love it when foods evoke good memories. Jean you are such an artist! I have to say I spent a full 15 minutes just admiring the incredibly balanced photo of the cucumber sandwiches on the China. You have the perfect mix of Spring colors delicately balanced between the plate and sandwich. Very delicious! It is always your inviting photos of the food so beautifully presented that draws me in to linger over the recipe. I do love a cucumber sandwich...but have to admit I like it with cream cheese. A local restaurant used to serve marinated cucumber sandwiches before they closed a few years back. I have been trying to figure out how they marinated them...and now you have offered up a simple, easy, practical way to enjoy that extra flavor. Sue, thank you. You made my morning! Greg, I haven't found any food that can't be improved by putting it between bread, but then I AM a breadaholic! These look so perfectly delicate, I love the paper towel tip! Thanks, Sue! It works great. 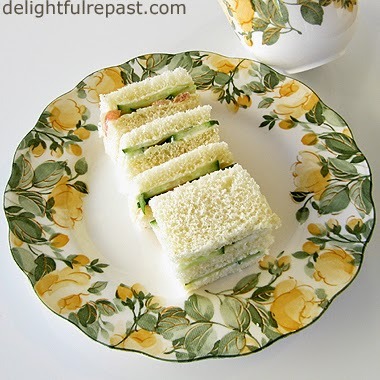 I love cucumber sandwiches...was raised with them for tea, and usually my favorite still! Thanks so much for linking to Tuesday Cuppa Tea! Thanks, Ruth. I love finding new (to me) "tea people'! just a little butter spread over the bread and then the thinly sliced cucumber here for me!! Gill, thank you! And I like just butter and cucumber, too. You can't go wrong with butter! I love coarse pepper. It brings out such a great flavor. I rarely put salt on anything but pepper arouses my pallet from a deep sleep. And, the wine vinegar, a perfect little flavor. I'm not a clever cook but can't wait to read more of your recipes. These cucumber sandwiches look terrific. Thanks for sharing the recipe! Thank you so much, Barbara! I hope you'll find lots to like! Carrie, thanks! Wish I had a plate of them today! Hi Jean, This is Mildred from Georgia. I've been away several months and have now started a new blog. So very nice to catch up with you. These sandwiches look so delicious. I am so anxious for Spring! Have a lovely day. Thanks, Mildred. I've wondered where you went! Thanks for stopping by and letting me know. I would like to try this afternoon tea sandwiches Jean, it is really nice alternative to regular cake or another snacks. thanks for sharing with Hearth and soul blog hop, pinning tweeting and sharing in google plus. Swathi, thank you. I prefer tea sandwiches to the cakes and pastries at afternoon tea. Social media shares much appreciated as I am not on most of them. Ahh, Mrs "Poo" - she was the best, wasn't she! And yes, a cucumber sandwich is such a perfect example of how food can be very, very simple, but, if done well, amazingly tasty. Thank you, Pauline. That's precisely the lesson I learned from my mother and grandmothers. Glad to hear you liked Mrs. Poo! Love cucumber sandwiches, I will try soaking the cucumber your way next time. I also remember a line in the movie Howard's End, where the trollop says "and did she serve you cucumber sandwiches, sliced ever so thin?". Buy the way, have you ever made crumpets? They are hard to find in the stores and I love them. I think they are made with yeast. Just curious. Thanks, Lana! I don't remember any lines from that movie now, must mean it's time to watch it again. I'm adding it to my queue now. Yes, I make crumpets, but it's been ever so long. I've actually intended to blog about them for a few years now, but haven't. Thanks for the reminder! Look for them soon. April, thanks so much! And I'll check out that board now. Now I'm in the mood for a tea party! YUMMY! Pom Pom, I'm always in the mood for a tea party! Do have one soon and tell me all about it! Thank you, Tania. I like that, "woman of taste"! I look forward to it. I would love to make a big batch of crumpets and freeze them. Lana, I'm so glad you reminded me to blog my crumpets! Jean,I agree you are an artist,not only about food,but also for your great photos!Looove the saucer and cup!Love your sandwich too,it looks delicious. Thank you so much, Maristella! Like you, I do love my china! Thanks, PP! I love Afternoon Tea Week! Jean, your cucumber sandwiches look just wonderful! Giving them a bath in vinegar for a few minutes is a fabulous idea! Mmm, I can just taste them. I have been away from my computer for most of the summer because my family has been home but I will be back soon to share some of what I've been up to. Hope your summer is lovely! Sandi, thank you! I don't know anyone else who does the vinegar bath (except my friends who learned it from me), but I wouldn't do it any other way. Looking forward to seeing what you've been up to! Oh these do look delicious Jean and this is a very desirable recipe! Looks wonderful and fresh! Thanks for sharing and linking. Thank you, Bernideen. People always love my cucumber sandwiches, and they are my favorite tea sandwich. It was very difficult when I became allergic to cucumbers and melons for several years, but I got over the allergy, thank goodness! Wonderful info re cucumber sandwiches and tea. I've pinned for a future lunch menu and looking forward to trying the wine vinegar trick. At my chiropractor's office they have a sign singing the praises of cucumbers and health. Will have to get a photo and post about it. Thanks, Sugar! I agree with your chiropractor, cucumbers are wonderful!